in a colander and leave in the colander until completely cool. 2. Meanwhile, return the pan to a medium heat. Add the butter and, when melted, stir in the flour. Cook, stirring, for about 1 minute or until thick and coming away from the sides of the pan. Gradually add the milk a little at a time, stirring until well combined between each addition. Simmer over a low heat for about 5–8 minutes or until thick and creamy. 3. Remove the pan from the heat and stir in the cheese. Once melted, add the mustard and season to taste. Tip the cauliflower into a large dish and pour over the sauce. 4. Preheat the oven to 200ºC, gas mark 6. Meanwhile, place the bread and truffle oil in a mini processor and blitz to make crumbs. 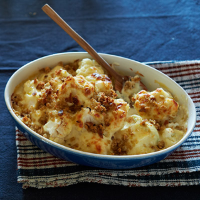 Scatter the breadcrumbs over the cauliflower cheese and bake in the oven for 25–30 minutes, or until golden and bubbling. Drizzle over a few drops of truffle oil before serving. To get ahead, make to the end of step 3, cover and chill overnight. Make the breadcrumbs but don't scatter them until the last minute, then cook as above or until piping hot throughout.